Storytelling Research Papers examine how its used to help with child development, and what it can teach about life. This is a Storytelling suggestion on Storytelling from Paper Masters. Use this Storytelling or order a custom research paper, written exactly how you need it to be. Storytelling is a flexible medium through which people can communicate, teach, and learn. Children are natural storytellers, and adults may take it for granted or assume that it is child’s play. However, teachers are very familiar with the benefits of using stories within the classroom. This paper will explore the concept of storytelling by explaining its role in child development, its history, and its usefulness in the classroom. Also, it will explain how best to use storytelling in the classroom. People first begin to tell stories in young childhood. They acquire the ability to verbalize about their experiences as they grow. According to an author , they become the narrated selves of their own lives as their ability to verbalize increases. Children can use the narrative in stories to imagine what could or should have happened, or to review actual events. In this way, stories have both social and evaluative functions in society. Dolls or toys are often used as props when children tell stories. Children may convey family relationships. 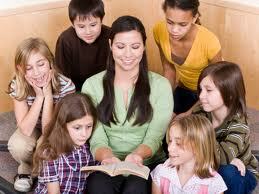 Interpersonal conflicts, likes or dislikes, and dreams and wishes are all themes of stories told by children. Development experts note that vivid stories stimulate listening, attending, remembering, sequencing, analytical thinking, and problem solving. As adults we have a duty to children to use storytelling to help them learn about life. Stories allow children to reflect on patterns and meaning in their lives, and parents should use stories to encourage this applied learning . In fact, when telling stories, parents need not offer explanations, as the stories convey their own meaning. Further understanding occurs with additional telling of the story. For instance, the mention of the word “Cinderella” will most likely invoke a complete story to a child very familiar with the fairy tale. One expert explained, “if the story is learned well, so that all parts can be seen at a glance, as if we looked through a window into it, then that story has become like the complicated hinterland of a single word… by which the whole story’s electrical circuit is switched into consciousness, and all its light and power brought to bear”. Child psychologists often utilize the ability of a child to use dolls or toys in stories by offering them in the therapeutic environment. The hope is that the child will use the props to tell a story. One therapist described using stories as a therapy technique. She told folk stories to communicate themes. This gave the client exposure to messages that confirmed, affirmed, and gave meaning to the child’s own experiences. The child was then better able to understand himself and others. Paper Masters writes custom research papers on Storytelling and examine how its used to help with child development, and what it can teach about life.